In this post I look at some plant constituents and actions. I am especially interested in the plants in a seventeenth-century recipe introduced in Working of Herbs, Part 2. Previously I raised issues related to finding out how medicinal herbs might work (Part 1), and locating modern herbal monographs (Part 4). Here I look at herb constituents and their actions because these are directly relevant to considering how a herb may take effect (or not) in a recipe. Of course, not everyone feels comfortable with the chemistry of plants so I have added some further suggestions in case this topic makes you go ‘AAArgh!’. Phytochemicals, or herb constituents, are fascinating (to me at least!). Knowing the likely effects of some key phytochemicals can be a great help in considering the herbs in recipes. Amongst the thousands of chemicals in each plant, it is often the ‘secondary metabolites’ produced as a defence against pests and diseases that can be used to some effect in our own bodies. Some have powerful effects, like Groundsel (Senecio vulgaris) which contains toxic alkaloids (Figure 1). Many phytochemicals are surprisingly well-researched so that we know about their likely effects – their herbal actions – even though clinical uses are much less well researched. Here I introduce an important group of plant constituents – the terpenes. Terpenes consist of chains of carbon and hydrogen units. They act as a deterrent to insect pests as well as inhibiting fungi and bacteria. The terpenes and related compounds are highly aromatic: many evaporate readily and form the basis of essential oils extracted from plants by distillation. Plants in the Mint family (Lamiaceae, previously known as Labiatae) contain terpenes which vary considerably in action from stimulant to sedative effects. The simpler stimulant monoterpenes include molecules like menthol with a recognisable minty aroma. Some of these smaller molecules are highly active, often metabolized quickly in the body, with significant neurotoxic effects. Thujone (Figure 2) is one such monoterpene with a reputation for toxicity. 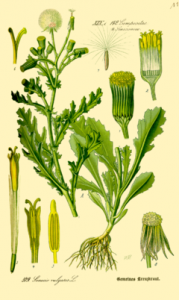 It is found in wormwood (Artemisia absinthum), an extremely bitter-tasting plant in the Daisy family used in the making of absinthe. Thujone is also found in some Mint family members like hyssop (Hyssopus officinalis) and sage (Salvia officinalis). This monoterpene acts on uterine muscle, causing contractions, and hence has a reputation as an abortifacient. Such plant constituents are one reason for caution regarding the use of essential oils in pregnancy. Other terpenes, such as diterpenes and sesquiterpenes, have a wide range of therapeutic effects – often particularly anti-spasmodic and calming actions. Both the Mint family (such as lemon balm (Melissa officinalis) and lavender (Lavandula angustifolia)), and the Daisy family (such as chamomile (Matricaria chamomilla) and yarrow (Achillea millefolium) demonstrate these actions. Another important group of constituents is that of flavonoids which can often be recognised by plant colouring (especially yellows, reds, purples). 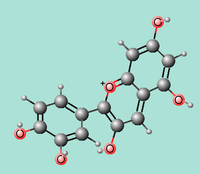 Flavonoids are polyphenols, consisting of linked rings of carbon atoms (Figure 3), and many are antinflammatory. Some other groups of plant constituents are less obvious, such as the colourless and odourless alkaloids. Alkaloids can significantly affect the nervous system either as stimulants (like caffeine in coffee berries) or as sedatives (morphine-like compounds in poppies). These and other kinds of plant constituents provide for an extensive range of herbal actions. Conclusion – ask a herbal expert! I guess some readers will be thinking ‘This is too much chemistry – help!’. If you are not so keen on the chemistry then perhaps you could link up with a clinical herbal practitioner who can help with understanding herb constituents and actions. In the UK you can find a herbalist through a professional organisation like the National Institute of Medical Herbalists. Alternatively you could consider posting a question to HIST-HERB-MED. This is a JISC-MAIL email discussion list which I help to co-ordinate for active researchers in the history of herbal medicine – replies are not guaranteed but might provide useful leads to helpful individuals or sources. A standard text on plant constituents is William C. Evans, Trease and Evans’ Pharmacognosy, 16th ed. (Elsevier, 2009). Also see Gunnar Samuelsson, Drugs of Natural Origin: A Textbook of Pharmacognosy (Stockholm: Swedish Pharmaceutical Press, 1992). However, the toxicity of absinthe may be partly due to the high level of alcohol consumed by regular drinkers, Karin M. Hold, et al., ‘A-thujone (the active component of absinthe): G-aminobutyric acid type a receptor modulation and metabolic detoxification’. Proc. Natl. Acad. Sci. USA 97, no. 8 (2000): 3826–31. More on herbs with abortifacient actions in John Riddle, Eve’s Herbs: A History of Contraception and Abortion in the West (Cambridge: Harvard University Press, 1997).